The Lake Havasu Area Chamber Ambassadors held a ribbon cutting ceremony for Havasu Pest Control, celebrating its 40th anniversary. Attending the ribbon cutting from left to right were Mike Schuler, Sam Stebila, Primo, the dog, John Stebila Jr. Owner of Havasu Pest Control, Ike Webb, General Manger Michele Webb, CEO of Havasu Pest Control Kayley Galati, and Katie Schuler. Havasu Pest Control is a full service pest control and home inspection company with 25 employees. 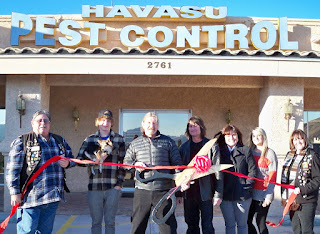 Havasu Pest Control is a proud member of the Lake Havasu Chamber of Commerce and an active supporter of the community as a whole. For more information contact them at 928-855-1054.